Baltec was formed in 2000 by the Richardson family and was acquired via a share swap by EGL in November 2013. Baltecs’, the Directors, Management and Staff currently have a substantial shareholding EGL. Baltec designs and manufactures a range of products predominantly for international blue chip customers primarily within the power industry. Baltec products include inlet filter houses, fogging systems, silencers, and guillotine dampers, bypass and HRSG exhaust stacks, heating and cooling systems and diverter dampers. Baltec products are accredited by most international gas turbine manufacturers as well as major EPC and HRSG companies. Baltec enjoys markets worldwide but has a strong Asian focus and cultural understanding. A significant volume of work is derived from repeat business. EGL is represented in Indonesia through its subsidiary, PT Baltec LTD, which received an award as one of the top 10 EPC companies servicing the electricity market in Indonesia. 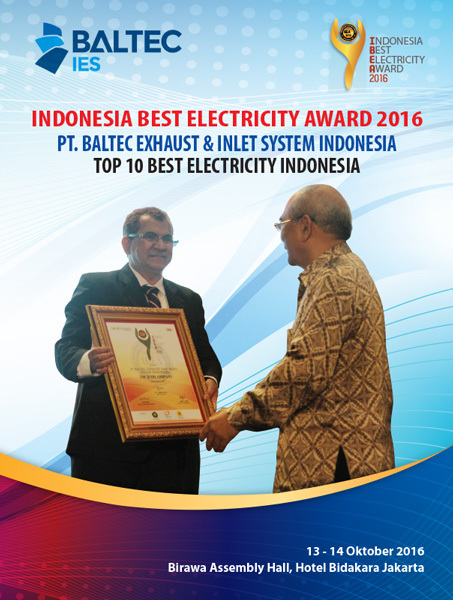 The award was presented to Pak Ahmad Basalamah our resident Director in Indonesia by Pak Edwin Hidayat Abdullah Deputy Minister. Total Air Pollution Control Pty Ltd is an Australian owned and managed company that was formed in 2001. TAPC quickly established itself as one of the region's leading industrial air pollution control companies, particularly in the field of particulate capture using electrostatic precipitators and fabric filters. In 2007 EGL acquired TAPC. TAPC designs and manufactures a range of products predominantly for local blue chip customers within the mining and manufacturing industries. TAPC products and services includes design, construction maintenance, rebuild and delivery of electrostatic precipitators, fabric filters and gas cleaning systems. TAPC enjoys a significant share of the Australian markets and is currently expanding into international markets, initially within Asia.